Sony and others are dedicated to making a big push at dominating the archival cold storage market with optical discs. On previous email blasts, we spoke about how Sony and Panasonic, amongst others, are focusing heavily in the data archival market using optical disc cartridges and developing optical discs with massive storage capacity. A recent article in Fortune further emphasizes this point. In the article, it discussed how Sony has acquired a startup company that was created by a former Facebook executive for the sole purpose of archiving cold data for easy storage and retrieval offline. The impact of this acquisition is huge as it relates to data storage, the life expectancy for optical discs, and how cold data will be maintained and stored in the future. Just by its name, â€œcold dataâ€ itâ€™s obvious that content is not something that will need to be recalled frequently or even sparingly. Typically its data that needs to be saved, but is rarely accessed and certainly doesnâ€™t need to be accessed within fractions of a second. So why waste valuable server storage, expensive energy, or IT time to maintain this data? There is no reason, and the cold data becomes a drain on servers, making the hot data become bogged down and more costly to maintain. The answer to how cold data should be handled is to store this content offline, on optical discs. When you need to recall it, simply pull up the optical disc itâ€™s stored on through an intricate indexing system that can be recalled in seconds and keep it all offline. That way the data is safe, itâ€™s not syphoning energy as it would on a server, and it frees up a tremendous amount of space for more critical data. So when you wonder how long will optical discs remain relevant? Apparently major companies like Sony are betting it will be a very long time! When you want the best Optical Discs for any format or printable surface, that answer is clear as well, contact Vinpower Digital. Vinpower offers optical media for all markets, formats, and price points with top quality and reliability. Contact a Vinpower representative for more details on our wide range of optical disc options. With the news that Taiyo Yuden stopping the production of all lines of Taiyo Yuden and JVC branded media, where can one find a suitable alternative? 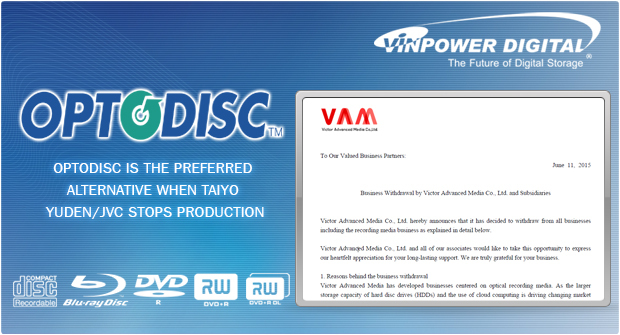 Fortunately, Vinpower developed the Optodisc line to follow the strict quality standards and reliability that Taiyo Yuden pioneered when they developed the 1st recordable CD-R many years ago. The Taiyo Yuden (TY) and JVC brands have been the standard bearers for recordable CD-R and DVDÂ±R for many years. With the surprise news that they will shut down production, it leaves a large void in the market for high quality reliable recordable media. Optodisc was developed with the TY concept in mind. As a manufacturer of duplication hardware for over 15 years, Vinpower has a great understanding about recordable media and how it needs to hold up under the rigors and fast pace of the duplication market. So when we developed the Optodisc line, we wanted to make sure that it was suitable for high volume production, but reliable enough to meet the high standards of the critical medical and storage markets. So regardless of whether you need an inkjet or thermal printable surface, or require a reflective silver lacquer finish, Optodisc has what you need across all formats, including CD-R, DVDÂ±R, DVDÂ±R DL, BD-R, and BD-R DL. Contact a Vinpower representative today for more details about the full Optodisc line. 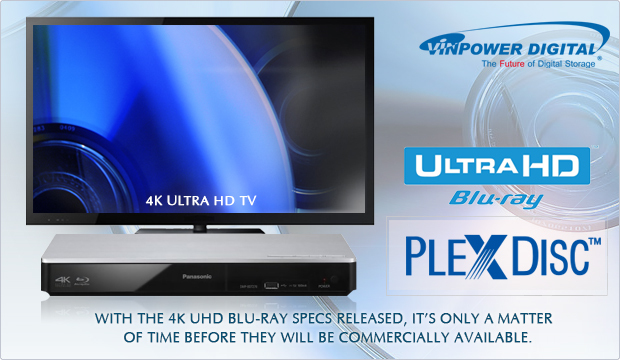 With the 4k UHD Blu-ray Specs Released, itâ€™s only a matter of time before they will be commercially available. â€¢	There hasnâ€™t been a new disc format since the original Blu-ray was introduced and subsequently won the HD format war from HD DVD in 2006.
â€¢	Now 4K TVâ€™s finally will have a player and content that can be played in the comfort of oneâ€™s home. Itâ€™s no small feat to adopt a new format specification. Firstly, it takes multiple engineering teams across multiple industries to develop and sustain the new technology, which can be made readily available for the general audience. Secondly, it takes a consortium of major corporations to agree and to iron out who holds patent rights for this new format. Surely Hollywood studios along with TV and Blu-ray player manufacturers are excited about the opportunity for a new format, which will create a new market for 4K content and devices to play it on. Vinpower is also excited about the new format and that the media specifications have been finalized. This will allow us to support our growing market with 4k/UHD duplication hardware and media that will meet all industry standards in the very near future. Since Vinpower works diligently to stay ahead of its competitors in being able to offer new ODD duplication technology first, you can rest assured that Vinpower will pay close attention to when media manufacturers go into production using the newly approved UHD specs, making the discs available through our network of dealers and resellers. For more details on all of Vinpowerâ€™s digital duplication hardware, media, and printers, visit our website or speak with a Vinpower representative today.